Last Saturday, Dan and I spent a day with our friend Juliette, who was in New York for work. Juliette owns the sweetest little bungalow in Lake Worth, Florida, complete with a fish pond and a front porch and all sorts of enviable things to apartment dwellers like us. Whenever we're in West Palm Beach, we have dinner with her and her boyfriend Nathan, and she usually has us over for a cup of tea or a glass of wine—a welcome escape from non-stop family time. It's all very relaxed and grown-up and makes us seriously consider moving back down South and buying a similarly cute house, at least for a split-second. Naturally, we wanted to return the favor while she was in town. Her flight got in early Saturday morning, eliminating the chance for breakfast or brunch. 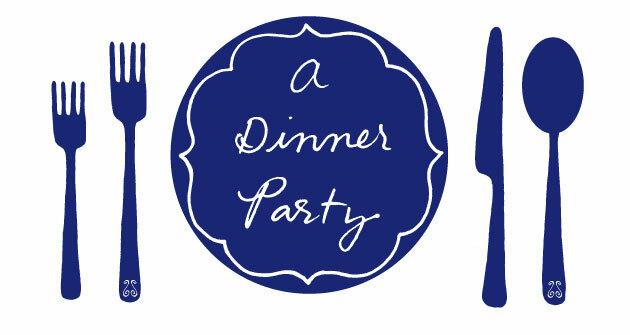 And I had a bachelorette party that night, so dinner was out too. Which left...lunch. And I realized I had never made lunch for anyone before, aside from things in Tupperware eaten over your keyboard at work. Having someone over for lunch seems really quaint, doesn't it? Like something your grandmother would do. So I pulled out my trusty pad of Post-Its, and tried to figure out a menu that wasn't too brunch-y, or heavy, or complicated. Lunch should be light and interesting, not too much of a production. And most important of all, everything had to be made without the oven. I couldn't bear the thought of Juliette sitting on our couch, sweat dripping down her face. So, light, cold, interesting. Here's what I came up with. I've made a ton of fish and shrimp dishes at home lately, but my summer cravings for seafood have still not been satisfied. So last week my friend Brooke and I had dinner at the venerable Pearl Oyster Bar. After a bowl of mussels I could certainly make better at home, an underwhelming lobster roll (that the staff tried to sneakily overcharge us for), a slice of blueberry pie that was just meh, and all-around nasty service, I left feeling quite disappointed. You'd think the experience would end my taste for seafood, but instead it left me jonesing for a decent lobster roll. So apologies to Rebecca Charles, but I decided to re-make her much-touted lobster roll for our lunch, substituting shrimp for the lobster. The shrimp salad, served on buttered, toasted Pepperidge Farm hot dog buns (just like at Pearl's) was simply dressed with mayo, lemon, and celery. Although nothing compares to lobster, everyone said the shrimp was a fine stand-in and lent a slightly sweeter flavor. And unlike going out, you never get bad service (or have to haggle over the check with an impertinent manager) when you're at home. The original recipe, from Rebecca Charles' book Lobster Rolls & Blueberry Pie serves two and calls for four 1 pound lobsters. The shrimp cooking technique is cribbed from Ina Garten's shrimp salad recipe, which also sounds delicious. Bring 5 quarts of water, a generous pinch of salt, and 1 lemon, cut into quarters, to a boil in a large saucepan. Add the shrimp and reduce the heat to medium. Cook, uncovered, for only 3 minutes, or until the shrimp are barely cooked through. Remove with a slotted spoon to a bowl of cool water. Bring the water back to a boil and repeat with the remaining shrimp. Let cool, then peel and de-vein the shrimp. Chop the shrimp into 1/2-inch pieces. Combine shrimp, mayonnaise, the juice of 1/2 a lemon, celery, and salt and pepper. Cover and chill until ready to serve. Melt butter in a large nonstick skillet over medium-high heat. Press open buns, and place in skillet, turning to coat both sides. Cook buns until golden brown on both sides. 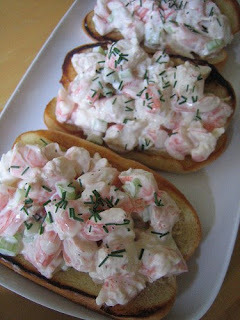 Fill bun with lobster filling, and sprinkle with chopped chives, if desired. the lunch (and the company) was lovely. i do not cook but once back in florida the meal stayed long enough with me that i had to dial up lisa for the recipe so that mister hall could replicate it. amazing.